If you want to change the interior of your home,Do not necessarily change furniture and do repairs. It will be enough for several nice crafts made by themselves. Lovely, funny, and sometimes practical things are easily and easily made from improvised materials and with a minimum of costs. 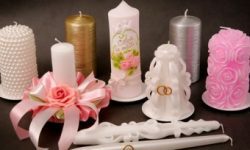 If there is a question about how to decorate a room with your own hands, first of all you need to decide on the type of jewelry. How to decorate a wall in a room? A practical and original decor can serve as a mirror. A favorite of designers - repeated repetition - many identical in shape, but different in size mirrors will give originality. This technique can be used not only in residential buildingsRoom, but also in the bathroom. The second option is a wall clock. You can hang a few similar, but set them on different times, for example, choosing time zones where relatives or friends live. Kitchen or dining room can be decorated with a collage ofPlates. It will result in space saving, and decorating. They can be the same or different size, but it is desirable that all were in the same color scheme. They hang them either chaotically or evenly. Frames with photos are classics, butInstead of a photo, other things are placed in them, for example, geographical maps, slices of newspapers, drawings from old T-shirts, etc. If there are children at home, their drawings will serve as a good decoration. Even if there is a good repair in this room,I want to add coziness. You can do this with a variety of accessories and decor, for example, vinyl stickers or stencils, sold in sanitary ware shops. They are realized in a large assortment of sizes, shapes and colors, so picking them up under the general style of the bathroom will not be a problem. In addition, a special fabrication materialResistant to moisture. Stickers are sold with instructions and the necessary tools for work. Stickers are glued to walls, furniture, compacts, panels. Stencils are reusable, they are simply applied to surfaces and painted over with paint. Popular in recent times, decoupage techniques. How to decorate a room with the help of decoupage techniques? For work necessary: ​​three-layer napkins with a pattern; PVA glue; acrylic lacquer; Brushes for drawing; scissors. Then the treatment with varnish follows. This method is decorated with walls, furniture, plumbing and even toilet lids, not to mention various hygiene items. Also, the bath can be transformed with the help of original towel holders, cosmetics containers, brushes, shower curtains, mirrors, rugs and even paintings. 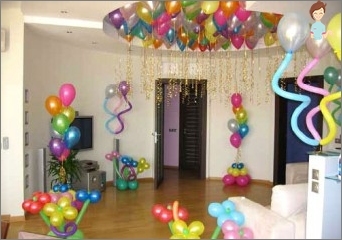 If you need to transform the room for a holiday,Balloons are the best option. They will make elegant any room. This design will be enjoyed by both adults and children. Helium balls under the ceiling cause admiration. At home, you can make conventional pendants orDraw a note from them. More expensive option - balls with printed logo, picture or text printed under the order. Without special skills make garlands, inscriptions, figures from balloons. 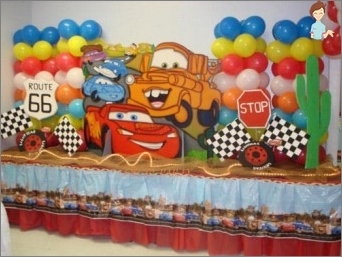 With the help of professionals you can decorateRoom with three-dimensional figures and figures. Simple figures are performed both from balls filled with helium, and from special balls-sausages for modeling. To create an arch, panel or other three-dimensional shape, use skeletons. 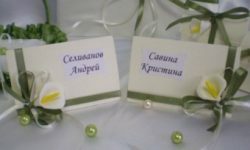 Wedding - a significant event in the life of eachWomen and, of course, an appropriate atmosphere is needed. Decorating a bride's room is quite simple, for example, the above-mentioned balls. Flags are also used. 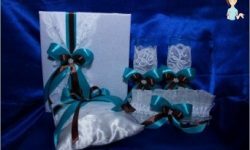 They can be large and small, cloth or paper, with inscriptions and patterns on the wedding theme. An interesting decoration for the ceiling, walls, doorsThere will be paper figures on threads. Their complexity depends only on the skill of the needlewoman. You can make hearts or circles, flowers or origami. Stringed on threads, they will decorate any surface and an aperture. 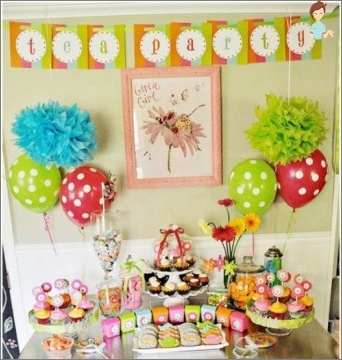 Effective decor will be paper fans of differentSize, bright colors. They perfectly fit as a background for a photo session with guests. Alternatives to the figures will be pompons made of paper. Especially beautiful during the winter wedding will look garlands of light bulbs. Always actual will be fresh flowers. Usually they are selected in accordance with the bouquet of the bride. Fine decorations will be vases on tables, flooring large containers, buckets and even vintage cages with living plants. Effectively look garlands of natural colors, hanging from the ceiling. Rose flowers will help to create an atmosphere of romance. They cover various surfaces. You can take fabric petals, which in a large range are offered in specialized stores. A candle can complement the style. Many students are required to live in hostels. The rooms in them look quite conservative, so often want to add home comfort. First of all, you need to learn about the rules, maybe you can not make holes in the walls, so hang something will be difficult. Also need to discuss decorating with a neighbor byRoom. After that, you can make a small rearrangement, if this permits the rules, for more comfort, because not everyone likes, for example, the table in front of the window. Then you can take up the details of the room in the dorm. Add comfort will help an interesting bed linen or bedspread on the bed, decorative pads. To store a variety of trifles, the original container is suitable, you can buy a whole set, but it is desirable that it should match the color and style. On the floor is to put a rug, which is not onlyWill become a practical thing, but will complement the interior. To have more space, some things are stored in drawers under the bed. The walls are decorated with the above-mentioned garlands of light bulbs or paper figures. Usually it is allowed to fasten something with scotch tape,So you can safely hang your favorite posters and posters. The original curtain will look like the whole wall with photos, cut-outs and other pleasant trifles attached to it. Decorate the window opening can be nice curtains, which will add warmth and comfort. They can not only become excellent The interior, But also a practical thing, protecting from the sun. On the windowsill, of course, put vases or vases with fresh flowers. They are completely safe for children. For a festive table, a plasticDishes that are now offered in a wide range. First, it is safe, does not beat. Secondly, in the range of plates and cups with different patterns, drawings, so you can choose your favorite child's hero or under the overall design of the room. If there is time, you can fold the origami and write on them the names of the young guests, that is, make original name cards. The same figures hang under the ceiling or on the openings of windows and doors. If you decorate the room with paper, then for some purposes it is better to take corrugated paper, for example, when creating crafts in the form of balls and pompoms. Garlands are a separate topic. Butterflies, hearts, cartoon characters and many other figures are offered in specialized outlets. They are inexpensive and save a lot of time.